Green farms and harvest was a forgotten dream for the residents of Bartunda village in Orissa's Balangir district. They had seen the worst drought in three decades last year, not to forget the innumerable famines that parched the soil and the pockets of the farmers. It was the women of the village who followed a dream, who trounced the drought, who ultimately, emerged as successful landowners. They started self-help groups (shg) in the village which amassed sufficient capital in cash and grain to tide through the rough patch. 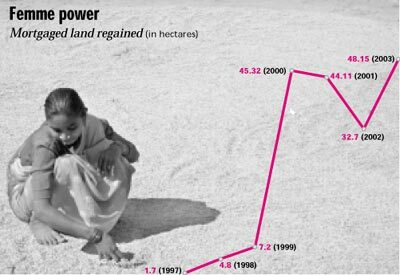 This was not the scene before 1997, when over 60 per cent of land was mortgaged, when farmers had to survive the onslaught of a drought coupled with spiralling costs in agricultural inputs. Many migrated to Raipur in Chattisgarh, sometimes leaving their wives behind. Miniketan Bhoi, a resident of the village says, "Today, we have over 50 quintals of grain stored. This is enough to feed us for the rest of the year even if we receive less rain in June this year." It all started in a village meeting in 1997, when over 20 women sought to find answers to make the village drought free. They discovered that small income generating programmes would not succeed. After much brainstorming, it was decided that with the savings of these women, over 55 per cent of mortgage land could be released. Women would then be the official landowners. Changing years of tradition, the men had to comply since it was the only viable option. Anapurna, the first shg with 20 women made their first bidding for the land, the next day. In the next few years, they released over 42.4 hectares of land belonging to 110 residents in the village. Faguni Nag, a member of the shg was among the first to release 1.61 hectares of land by paying Rs 5,000. This would not have been possible without the industrious saving each of these women did in their own homes. By keeping a fistful of rice away everyday, the 20 women started a grain bank. Since 1989 these groups have been keeping away one handful of rice everyday. by 1999, their assets were worth Rs 45 lakh, which included some financial help from other agencies. Putting that money to good use, the mortgaged lands were released. "We cultivate the land together and share the yield in a pre-decided proportion," says Mamta Jai, another member of the group. One part of the total yield goes to the landowner, another goes to the shg group as capital and the third, is distributed among members equally. In 2002, the group had over Rs 28,000 as cash. The village has eight such groups. For Indira Rout, a resident of Bartunda, it's the beginning of a new life after countless migrations along with her husband. Through the Anapurna group, she released her husband's .20 hectares of land from the zamindars (land owners) for Rs 1,500. "The land had to be treated with organic fertilisers for a year before we could start cultivation," she recalls. But in just three years, she has earned Rs 20,000 a year, which is 10 times the income she would have earned in five years. She realised that despite a drought, they could yield results. The spin off With lands in their control, the women were now aiming at a second crop for the year. Going back to rainwater harvesting systems that worked in the 1930s, the women were keen that land irrigation could be done through these traditional methods. Drought and change of ownership had ruined the 1081-odd structures which supplied water to over 60 per cent of the farms. Today, after much effort, the irrigation facility works on one crop for every released land. The shg managed to pay Rs 15,000 to lease a pond, which can be used for fishery and irrigation. The women have mended a two-kilometre road that links the village to the main road. "The land release initiative is a sequel to an already strong women's struggle," says S K Patnaik, director of Vikalp, a non-governmental organisation in Kantabanji, which helped these women groups in the effort. Vikalp supports over 1,000 such shg in over 15 villages. They have also been checking violence against women and illegal desertion of women in these shg. "Women had to gain access to resources, especially when domestic violence could not be checked," says Patnaik. Women of Bartunda in their pioneering effort have inspired neighbouring villages as well. Group savings and a small loan from the Balangir Anchalika Gramya Bank helped 21 women release over 13.35 hectares of land from moneylenders. They are now registered owners and cultivators of the land. Today, the movement involves 315 women across 23 villages. These groups have grown to about 1600 with over 24,000 members who are proud to have a capital close to Rs 1 crore. Of these, 1800 women in 100 shg solely focus on releasing mortgaged land. These women have ventured into onion cultivation as well. In 1993, 10 villages harvested over 50,000 quintals of onions. They have facilitated the Onion Growers Society which procures seeds and stores the crop in bulk. Grain and onions are sold to traders at market rates. The society has set up two onion storage facilities, as well. The land release scheme saw women coming together at the village and block development level to form an informal federation, to facilitate income and distribute the capital judiciously among the sgh. It reviews land released and explores new areas of work. Sanjay Mishra of Vikalp says the economic benefits are visible and the institution is breaking new ground. Vikalp has started collections for a revolving fund to release all mortgaged land for the shg, while the money would be returned in installments. Legends have applauded resourceful women who have held their own in the midst of storms and strife. For a district that has seen droughts for over half a century, for a people who merely existed, the shg scheme paves the way for a hopeful future.